The closest thing I’ve ever seen of the United States was at a vantage point in Cuba from where we can see –quite far away– the unwanted Guantánamo Naval Base, in the eastern part of our country. I also got a bit close when I visited Canada, many years ago. Well, and from Mexico, not that long ago. That is, from the two bordering nations, although I did not cross the border. 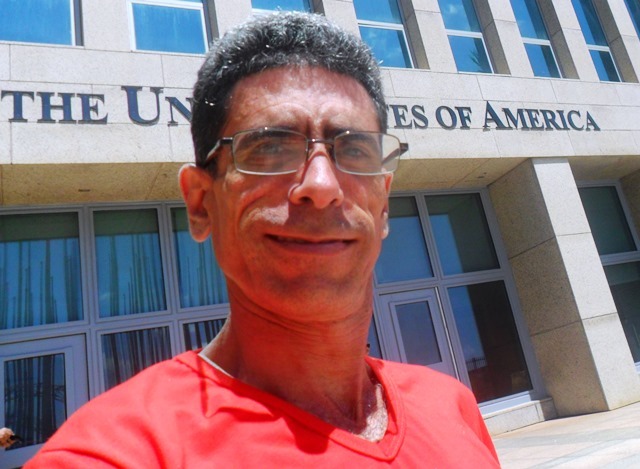 But this time I have stepped –technically speaking– on US territory, on my first visit to the Embassy of the world empire, here in Havana. The motive was noble, though; and the results were positive. I was invited –as one in a small group of ten people whom the Embassy identifies as activists for the rights of the LGBTI community– to participate, this June 28, in a worldwide interactive electronic chat on thr occasion of the Gay Pride Month. I found it a pleasant surprise that, in times like these, the State Department organized a panel on “Perspectives and voices to face hate crimes”. There were two interesting panelists and a moderator who were in New York and Washington. It may be a good sign that President Trump cannot turn back everything that the American people have already conquered. Beberly Tillery, executive director of the New York Project against Violence, and Brett Parson, who oversees the Special Links Division of the Metropolitan Police Department in Washington, responded to questions from activists, officials and other participants who had been invited to the United States embassies in Chile, Canada, Tunisia, Malawi, and Ecuador, among other countries. To our delight, this exchange –that lasted just over an hour and a quarter– included one of the many questions we had sent from Havana. On closing, there was a brief summary where there seemed to be consensus on the similarity of many of the episodes of discrimination, violence and homophobic and trans-phobic crimes suffered by LGBTIQ people in the world. This included in the nations that have advanced the most in public policies and specific legislation on the topic. For this reason, several participants pointed out the importance of maintaining a more fluid exchange of good practices between and within civil society and government institutions like the police. In particular, I reiterated my old idea that the coincidences between Cuba’s and the United States’ policies in relation to the fight against homophobia and trans-phobia could be one of the means of rapprochement. Of course, with the proviso that the current administration rectifies its current backward standing, and there is an eventual rescue of the process of normalization of relations that President Obama began. So far, this was a summary of the content of the meeting. Now, I’ll add a little bit of folklore, with my most personal expressions and impressions. On the way out, I hurriedly took this selfie, because it is not allowed to bring in cameras or cell phones. I cannot deny that I was curious to see the place; to nose around the environment of that building so mysterious and emblematic in our history and city. 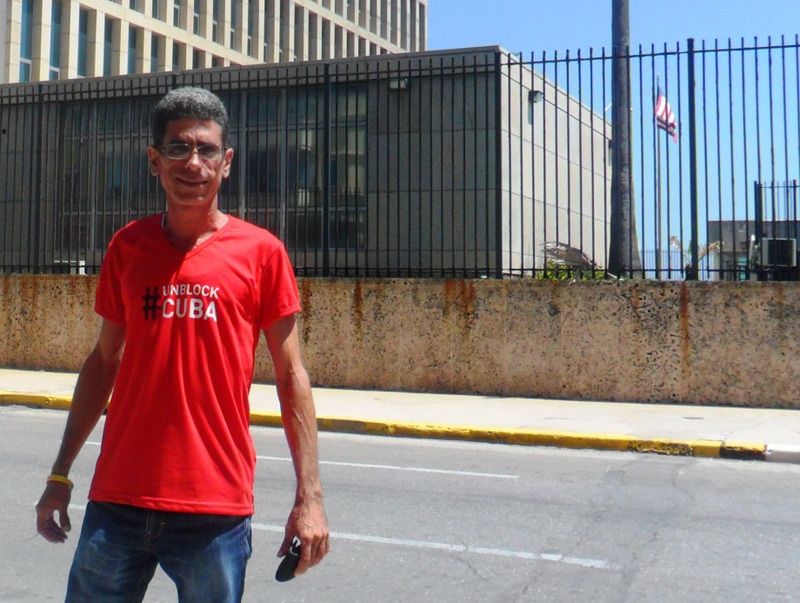 A building that the majority of the Cuban people only see from outside, mostly when we march along the Malecon or rally at the Anti-Imperialist Tribunal to protest against successive US governments. Therefore, to keep the tradition, I thought it would be OK to take part in the dialogue, but also to make a statement –even more so if this time we were remembering the disturbances of Stonewall: an act of rebellion by definition. And so I found a nice red pullover –special for the occasion– with the phrase #UNBLOCK CUBA. This was an initiative that some compatriots present welcomed. I must acknowledge the politeness and professionalism of the diplomats who received us: Messrs. Derek Wright, Political Secretary, and Justen A. Thomas, First Secretary with the Press and Culture Office. They courteously ignored my T-shirt. I was left with the concern that –maybe because of it– a group photo was not taken. I had been so looking forward to have them pose by my side! I was also a bit disappointed, because in that place –where I thought I would enjoy fantastic air conditioning– full of that freedom of expression they keep throwing at us, I was not allowed to bring in my cell phone or my digital camera. And they also made a number of suggestions on what to say or not about this encounter in our blogs and social media network profiles. By the way, I did not understand very well what they said, and for that reason, I may unintentionally fail to comply.